The next-generation of GMC Sierra trucks is here, and they’re bolder, larger and more intelligent than ever before. Meet the new 2019 GMC Sierra 1500, a new GMC pickup that’s been engineered to exceed expectations and redefine what’s possible behind the wheel. From its class-exclusive features and game-changing capabilities to its new innovations and more, the 2019 Sierra 1500 will leave a lasting impression. The 2019 GMC Sierra 1500 release date will happen in fall 2018, so secure your test-drive today at our GMC dealership near Augusta, GA, to experience professional-grade engineering for yourself. The 2019 GMC Sierra 1500 truck offers an impressive lineup of dynamic powertrain options. Choose between a 5.3-liter V8 engine with an 8-speed automatic transmission or a 6.2-liter engine with a new 10-speed automatic transmission, and see what your new GMC pickup is capable of achieving. If you want the power and finesse of a 3.0-liter Duramax® engine with 10-speed transmission, upgrade to the 2019 GMC Sierra 1500 AT4 trim. 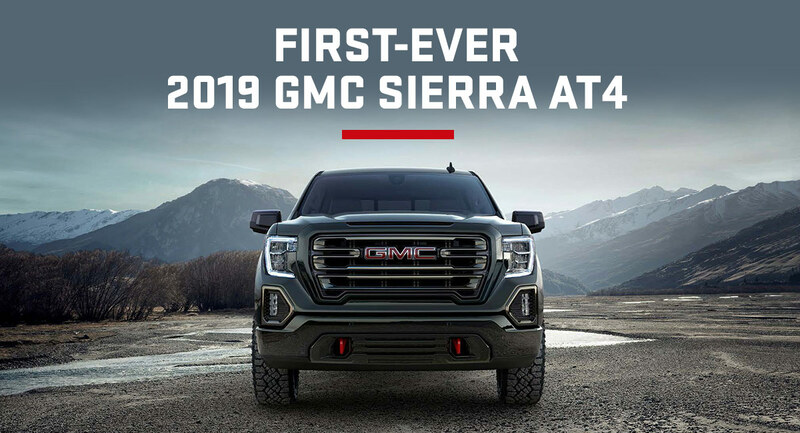 The 2019 Sierra 1500 AT4 truck grants you the off-roading capability you need to tackle any challenge with its 2-speed transfer case, Monotube Rancho® shocks and off-road tuning, and 2-inch factory-installed suspension lift. For the 2019 model year, a new GMC MultiPro™ Tailgate has been added, which can be configured in six unique functions and positions. Plus, if you select the 2019 GMC Sierra AT4 trim, you’ll receive a best-in-class cargo box volume of 62.9 cubic feet to help you store more.1 Inside the cabin, you’ll enjoy the convenience of the segment-first Multi-Color Head-Up Display with a 3-inch-by-7-inch display, and the protection of a segment-first Rear Camera Mirror. And when you upgrade to the 2019 Sierra AT4 truck, you’ll gain access to Surround Vision and leather-appointed seats with embroidered AT4 badging on the headrests, too. If the new 2019 GMC Sierra 1500 truck sparks your interest, contact Jimmy Britt Chevrolet Buick GMC to learn more. We’re happy to walk you through the 2019 GMC Sierra 1500 AT4 specs, or another trim of the new 2019 GMC Sierra, so visit us today! 1 On the Short Box. Cargo and load capacity limited by weight and distribution.